LAS VEGAS, NEVADA (March 5, 2013) CounterPoint® is pleased to announce the addition of their new Frame-It® MagLift® counter mat to their already extensive line of products. The Frame-It® MagLift® uses a magnetic lift-top allowing for easy access to interchangeable promotional materials. With this counter mat, it is easy to update inserted collateral keeping the promotion current and lively while customers enjoy fresh, updated information. "The Frame-It® MagLift® counter mat is a fantastic addition to our product line", announced Laura Martinez, CounterPoint® Sales Manager. "Our customers asked for a magnet-based version of our popular Frame-It® window counter mat and I think they will be pleased with the durability and versatility of MagLift®. As a lift-top style window mat, MagLift® makes it very easy to change out the inserted material that keeps the promotion current." This new counter mat has built-in magnetic strips on the base as well as the surface, which holds the window closed securing the promotional materials inside. Frame-It® MagLift® is built with the popular Vynex® surface and is available with the durable Heavy Duty rubber base or the new DuraTec® latex-free synthetic rubber backing. They come in nine standard sizes, custom sizes, and 1/16" or 1/8" thicknesses. For more information about this exciting new product, visit CounterPoint® at www.doyoupop.com. CounterPoint®, along with sister companies Digispec® and Visstun®, is part of a family of companies producing American-manufactured products in its Las Vegas headquarters. 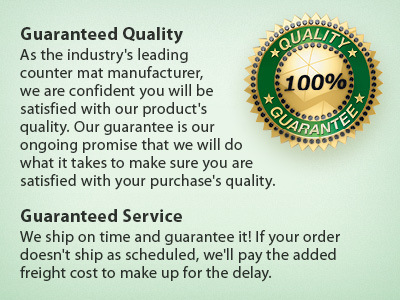 Launched in May 2001, CounterPoint® has become America's largest manufacturer of point-of-purchase counter mats, which are produced using a unique manufacturing process that utilizes high quality polymers, plastics, and base materials not traditionally available from local printers and generic POP suppliers. CounterPoint® has been honored 10 times, recently receiving the Gold Award for Sublimation in 2012, being honored with the ASI Spirit Award for the Top 10 Fastest Growing Suppliers in 2005 as well as being named by Counselor as a Best Places to Work in 2012, 2011, 2009, and 2008. Additionally, CounterPoint® has received five PPAI Supplier Achievement awards. For more information please visit us at www.doyoupop.com.